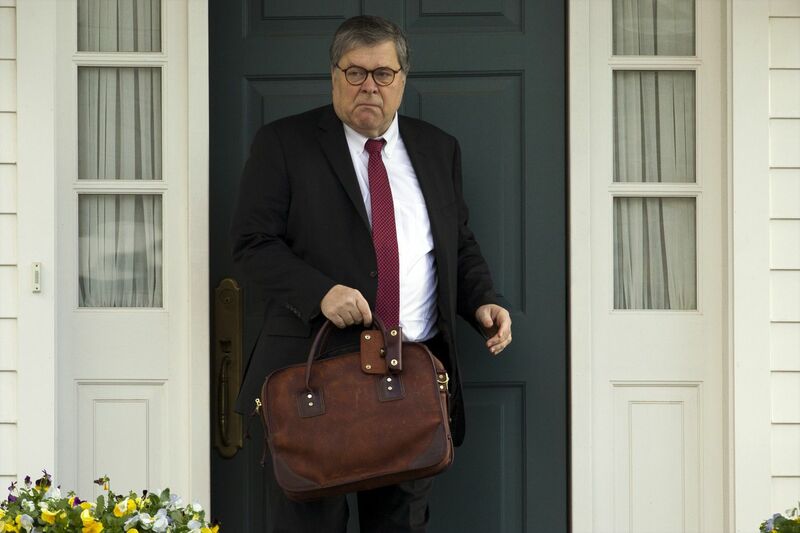 Attorney General William Barr leaves his home in McLean, Va. That day Barr told Congress to expect version of special counsel's Russia report by mid-April. The attorney general of the United States has just executed a cover-up so brazen, so grotesque, so audacious, that it was done in plain view. Right under our noses. He put two spaces after his periods. And then he fully justified — instead of left-justified — his paragraphs to try to hide it. To wit: The March 24 summary of Robert Mueller’s nearly 400-page report that William Barr sent to the Senate and House Judiciary Committees came in at four pages. Without the extra spaces, it might have been just 3½. Or Barr’s March 29 letter to the same committees, in which he said members of Congress will have to wait a few weeks before they can read Mueller’s report. Again: two spaces after every period. Look between his words. The extra space is clear, and it’s criminal. How many spaces does Mueller use? Is Barr simply following the special counsel’s example? We won’t know till mid-April, at least. Though we might have Barr’s redacted version of Mueller’s report a week earlier if Barr didn’t waste so much time typing unnecessary spaces. If you learned to type two spaces after every period, it’s because you were taught to type on a typewriter, or you were taught to type by someone who was taught to type on a typewriter. Long before they were de rigueur for artistic hipsters broadcasting to the world that they are Serious Writers, typewriters were the standard in which each character — letters, punctuation, and spaces — took up the same amount of room on the page. In this sad, monospaced world, two spaces were necessary after periods to give the eyes a break every time your sentence ended. They made reading easier. But word processors are a lot smarter than typewriters. They can handle proportional fonts, like the one you’re reading right now, in which a petite little i takes up way less space than a sprawling, double-wide w. Knowing that the eye (and your thumb) needed a break, word processors began inserting tiny extra spaces, measured in points and pixels, after each period. Just a fraction of a character — not a full extra space. Now, hitting the space bar twice, instead of producing a helpful visual respite, leaves a cavernous sinkhole of white space that is distracting to the eye rather than helpful. Double-spacers are usually easy to spot. But when they use full-justified text instead of left-justified, the spacing is uneven everywhere, making their crimes harder to detect. Full justification presents its own readability problems. If you’re reading this column in print, this text is full justified, whereas if you’re reading on the web, it’s left-justified. Full justification might be more attractive, as it creates a consistent right margin. But for readers who suffer from dyslexia, the extra white space can distract from the words themselves — the eye is drawn to the white space rather than to the words — making reading an additional challenge. Adding an extra space after each period only compounds the problem. Low-vision readers have their own difficulty with full justification. When reading on the web, they will often increase their browser’s font size. If the right text edge is ragged, as it is in left justification, lines don’t all end in the same place, making it easier for readers to find the next line. In full justification, it’s easier to get lost. The fewer typographic obstacles you give your readers, the more they’ll persist in reading, and the more they’ll comprehend. That’s always the goal. Unless you’re the attorney general writing about an investigation into the guy who appointed you, and you’d rather the public not actually read and scrutinize what you’ve written. The Angry Grammarian, otherwise known as Jeffrey Barg, looks at how language, grammar, and punctuation shape our world, and appears biweekly. That’s every other week, not twice a week, friends. Send comments, questions and glyphic serifs to jeff@theangrygrammarian.com.